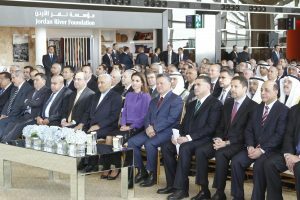 The new terminal building at Amman’s Queen Alia International Airport (QAIA) in Jordan was formally opened on March 21, 2013 after having a soft launch earlier in the month. Designed by renowned architect Sir Norman Foster, the new facility will have the capacity to handle nine million passengers per year, once the existing terminal is demolished and the piers expanded, nearly tripling the airport’s previous capacity of 3.5 million passengers and is a fitting start to a landmark year for the facility which celebrates the 30th anniversary of its construction. The first phase of the structure was opened on March 3, 2013 when the country’s national carrier Royal Jordanian switched its routes to Athens, Doha and Sharm El Sheikh to the new terminal to provide live operational testing. United Arab Emirates (UAE) carrier Etihad Airways also transferred its flights to Abu Dhabi to the new building at a similar time. This soft launch meant QAIA was better positioned for the official opening on March 21, 2013 when all flights from the existing facility were transferred across to the terminal. Just a week earlier on March 14, 2013 the new terminal was formally inaugurated by His Majesty King Abdullah II. The switch of operations took place following the departure of flydubai’s service to Dubai shortly after 22:15 on March 20, 2013, the last flight from the old facilities. Over the subsequent hours road access was switched to the new facility and approximately 4,000 staff, 30 concessionaires, 25 airlines, eight state authorities, six car rental companies moved across to the new terminal ahead of the departure of the first flights the following morning. The opening is of crucial significance for the future development of QAIA for its operator Airport International Group (AIG), which was awarded a 25-year Build-Operate-Transfer (BOT) concession by the Jordanian Government to manage and redevelop Jordan's premier gateway in 2007; a deal considered the most important Public Private Partnership (PPP) in the history of Jordan. AIG has invested approximately $750 million in the construction of the new terminal which it hopes will serve as a source of pride and prosperity for all Jordanians. The facility boasts vastly improved infrastructure, a larger check-in area, clearly marked signage and flight information monitors, comfortable seating, a larger duty-free area, and a wider variety of food and beverage outlets, among many other greatly enhanced features than its predecessor. Future expansion options will further increase the airport capacity to 12 million passengers a year as the existing piers can be extended to meet future growth in air travel. AIG has also spent an additional $100 million during the development phase on rehabilitating and improving the existing terminals to enable the airport to handle the continuous growth in passenger traffic. The opening of the new facility comes at an important time for Jordan’s main international air transport gateway as it reports record breaking traffic levels, which were placing a real pressure on the previous resources. QAIA’s overall traffic has witnessed remarkable growth during the period between November 2007 and December 2012, whereby passenger traffic and aircraft movements have grown by 62 per cent and 50 per cent, respectively. Located in the Zizya district, approximately 20 miles (32 km) south of Amman, the airport previously housed two passenger terminals connected via a link bridge and a single cargo terminal, but capacity was constrained. The facility, which takes its name from Queen Alia, the third wife of the late King Hussein of Jordan, has expanded beyond its means over the past ten years. 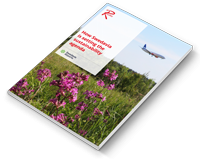 In 2006 it exceeded its announced capacity of 3.5 million passengers for the first time and despite the global economic crisis and regional tensions it has witnessed passenger growth for each of the subsequent six years. After recording a growth of 14.3 per cent in passengers during 2012 and reaching the 6.25 million figure, QAIA has had a strong first couple of months in 2013 with traffic up 2.6 per cent in January and 5.2 per cent in February, bringing total passenger levels across the first two months to 922,663, up 3.8 per cent over the same period in the record-breaking 2012. "QAIA's continued traffic growth is a positive indicator of the airport's expected performance in 2013, and underscores the necessity of the new state-of-the-art terminal in accommodating the projected increase in passenger and flight numbers," said Binger. "QAIA is poised to become a niche transit hub in the region, adding great value to Jordan's economic development and fulfilling His Majesty's vision for the airport. The figures recorded for 2013 to date represent a promising start to what we hope will be a milestone year for both QAIA and the Kingdom overall." QAIA is the main base for the country’s national carrier, Royal Jordanian, a full member of the oneworld global airline alliance, which operates over 100 flights per day. According to capacity data for 2012, the airline had a 56.8 per cent share of available seats at QAIA, which is considerably more than the shares allocated to its international rivals, the largest being Emirates Airline with a 4.6 per cent capacity share, EgyptAir with 3.5 per cent and Turkish Airlines with 2.9 per cent. Notable new arrivals at QAIA in recent years have been foreign low-cost operators including Air Arabia and easyJet, diversifying the product offering to potential travellers. Lana Hazou, Manager, Route Development, Airport International Group, spoke exclusively to The HUB at Routes Asia on what the infrastructure developments mean for the future growth strategy at Amman’s Queen Alia International Airport.